Metal Pole Umbrellas Provide Protection And Screening For Bistros, Patios, Pool Sides And More. Metal pole umbrellas are made of aluminum or steel for long lasting dependability. Reinforced rib design allows added durability and wind resistance. Canopies provide optimum sun screening, rain channeling and color sustainability. 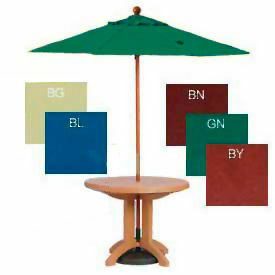 Umbrellas can be table anchored or used for freestanding applications with base (sold separately). Available canopy materials are Acrylic Fabric, Olefin Fabric, Polyester, Polyester Fabric, PVC Sling, SolarVista Fabric and Sunbrella Fabric. Open/Close methods are Crank, Pop-Up or Pulley. Color finishes are Beige, Black, Blue, Brown, Brown/Canvas, Brown/Tan, Canvas, Gray and more. Dimensions vary per model. Wooden Pole Umbrellas Are Designed For Outdoor Pedestal Tables, Folding Tables And More. Umbrellas with wooden poles are both aesthetically pleasing as well as functional. Canopies come in a variety of fabrics such as Polyester, Acrylic, Olefin, or Sunbrella to retain color and provide optimum performance in the sun. Crank or Pulley Mechanisms allow easy opening and closing of the umbrella. 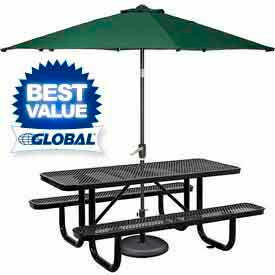 Can be used in freestanding applications with base (sold separately) or used in picnic tables with an umbrella hole. All umbrellas include reinforced ribs for extra strength and resistance to wind damage providing long lasting durability. Dimensions and color options vary per model. Umbrella Bases Provide Umbrella Stability For Applications Including Restaurants, Patios, Pool Sides And More. Umbrella bases are made of iron, stone and resin for long lasting durability and dependability. 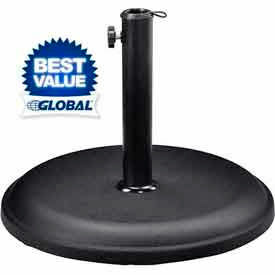 Bases secure umbrellas upright for table or freestanding use. Units may be water or sand filled for added support. Available colors include Beige, Black, Blue, Bronze, Champagne, Desert, Desert Clay, Gray and more. Dimensions vary per model.